I don't remember where I found the texture for kimono. The original pic is taken from the manga, somewhere from volume 4. EDIT: I changed the tree a bit and added some more colours to tears. I really hope it looks better now, because that damn sakura gave me quite a hard time and is still not ok.
anyways, I think you could make the shading in the skin darker. I would like to see a dark blue sky version too. The purple sky doesn't look bad but I somehow think a blue color would suit best because of her kimono. agree with kairi (yes i am semi-back-from-the-dead) change the color of the sky--either blue or like a calming pink/tan would be cute too. She is very pretty indeed. I like the sakura tree it looks very nice, thou I think it's supposed to be more brownish, the hair looks good, nice shadings and highlights. The pattern is alrigh, not very apealing but alright. I like the color you used for the skin outline.,,, I personally think that you should've sticked to just one bloody teary eye, or none, like this my first thought is circus. the only thing you can improve are her bangs, try to erase a bit the color at the end where the outline is not united, but don't do it with a full oapcity eraser, lower it so this way you won't chop off her hair. beautiful wall of shizuka! great vector! thanks for sharing! I think dark colors suit Shizuka. Something more mysterious and sad. Love your style of vectoring and keep it up! OMG, thats soooo freaky... how can anyone look at it for long... brilliant work. Very nice work, many thanx! So beautiful! 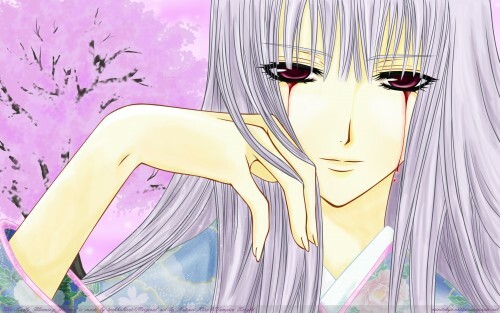 >_< I especially love the sparkly kimono. Shizuka looks sooo gorgeous in this wallpaper!